This Mental Health Together Bracelet signifies working together for Mental health. Made of beautiful lime glass beads and semi-circular silver plated tubes. 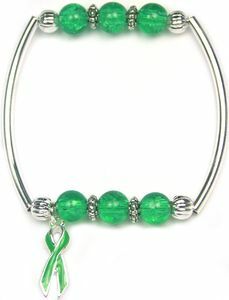 Each Mental Health Together Bracelet includes a lime awareness ribbon charm. The stretchy inner band makes them a perfect one-size-fits-all. Show your support for Mental Health. Features a lovely ribbon charm.